Get on the track to better health today! Do you need better nutrition? Processed foods are everywhere with additional salt, sugar and fats. Even if you eat “healthy” the nutrition value in our cultivated produce is not like it used to be. We are living longer, but not healthier. Patients struggle to make sense out of all the nutritional information. With our up to date education we can make sense of the jumble that patients are facing. There are components of your health that could be nutrition related. Call to arrange a consultation. Vitamins that are synthetic, too many, too varied, poor quality and taken with the wrong frequency can hinder health and healing. We can customize nutritional supplementation for what is best for you and easily modify it as your needs change. 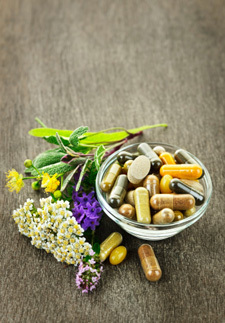 We use Standard Process® whole food products and Medhiherb® botanicals almost exclusively. Standard Process owns an organic farm. Both companies are committed to the highest level of quality, purity and bio-availability. Your condition may require vitamins, supplements or minerals. Call to arrange a consultation.